I’m no expert, but I’m not a dummy, either. The concept is grasped, it’s just the implementation that’s difficult. The idea of Fall soil preparation is not new to me, it’s just that I lose steam when everything freezes. It’s always been a little depressing to go out and wade through all the dead and dying leaves. Gardening, it seems, should be done with the warm sunshine at your back, on one of the first jacket-free days, not in wet, half-frozen mud. I prefer to wait until Spring to renew my faith and hope for a better garden. But I know. I know what I need to do in order to improve. I’m always hoping to become a better gardener some-year. Maybe it’s this one. 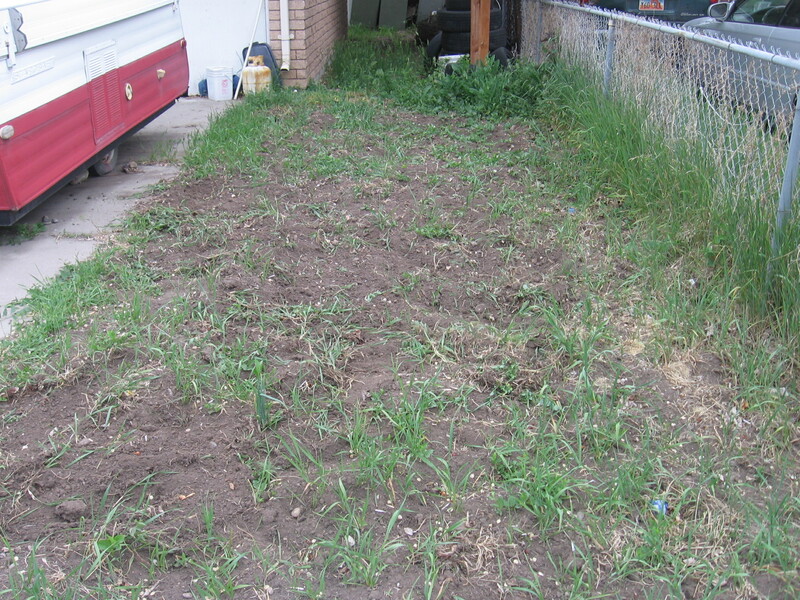 I got a late start last Spring, and I stumbled upon the lasagna gardening method too late to really do a good job of it. 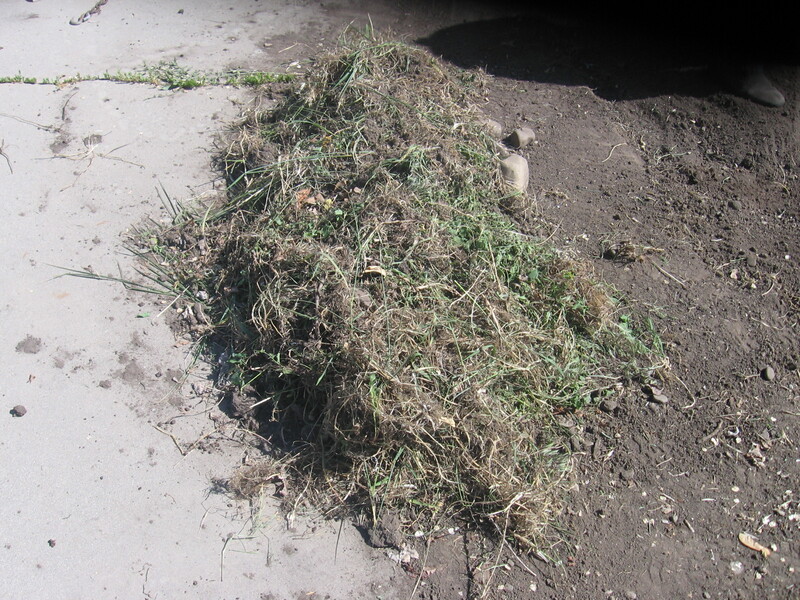 I spread straw–since that’s what I had available–instead of newspapers and leaves or grass clippings. Turns out the straw took root and thrived better than anything planted intentionally. I harvested eleven potatoes. That’s right. 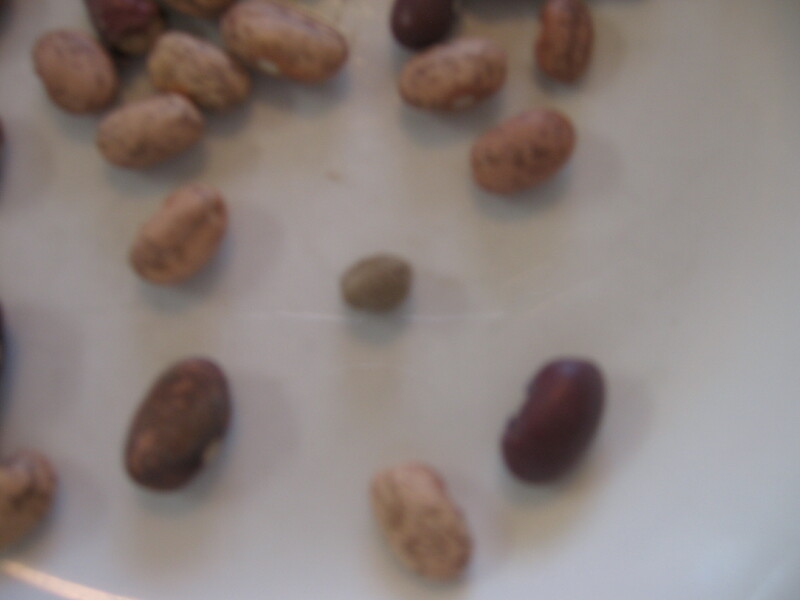 To break it down for you more precisely, that would be seven large reds and four small ones. Only one of my squash plants came up, and I wasn’t sure whether it was zucchini or yellow squash until I got one. Yellow. Who knew? It’s some kind of dubious honor that I can’t even grow zucchini, now, don’t you think? I got a few cucumbers, and the tomatoes were large, juicy, and plentiful, but came on so late that I was just getting used to having a regular supply of them when Jack Frost found them. That was the extent of it–a flash in the pan. But I’m not about to give up yet. I’m committed to doing it right next year, and to prove it, I’ve started collecting ingredients early. 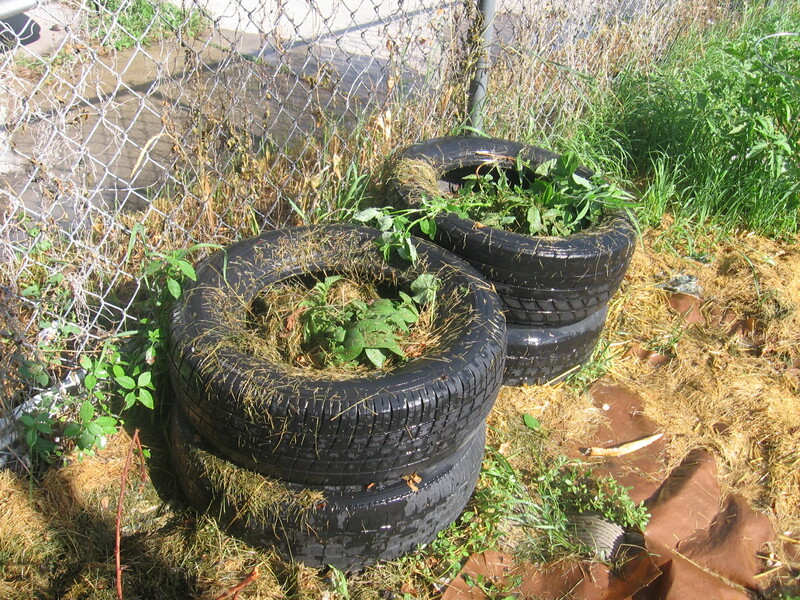 The first (weed prevention) layer includes a towering stack of newspapers about four feet high and a half dozen or so large flattened cardboard boxes. I will be surprised if a single weed dares poke its ugly head above this armor! Next, the enrichment layer is made up of the remains from all the tomato, cucumber, potato, and squash plants (not to mention loads of straw) all left to decompose under more layers of newspapers and leaves–approximately eight bags full of leaves from my yard and another seven or eight I got from neighbors. A half bushel of bruised and wormy apples, our dilapidated Halloween pumpkins, and a number of other organics were thrown in for extra nourishment. Until the rain started making it sag, this was piled up to my knees. The precipitation we’re expecting the rest of the week is just going to get the chemical decomposition process jump-started for the winter. Once it gets really soaked, I plan to cover it with a black layer and let it “cook” all winter. Looking forward to next Spring and planting time! Years ago I worked in a small “bake-off bakery.” What that means is that we baked fresh bread and rolls every day from frozen dough we received in weekly shipments from a bakery supplier. That was the only way we could have produced such a variety of different breads and sweets for the amount of space we had. 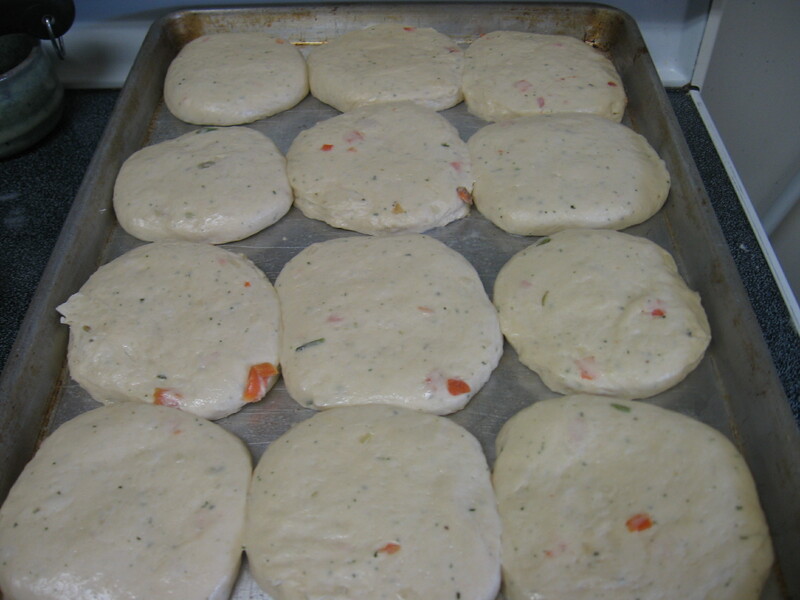 For a short while we were able to order a delicious vegetable bread dough. It smelled heavenly when it was baking and was definitely a favorite among a few of our regular customers, but we didn’t sell a lot of it, so it was discontinued. I had totally forgotten about Veggie Bread until some time about last Spring. I was walking through the bulk section of the grocery store and paused momentarily to wonder what you could do with dehydrated vegetable soup mix. Then the memory hit me. The outcome of my subsequent experiment was truly one of my best and gets rave reviews from my toughest critics. 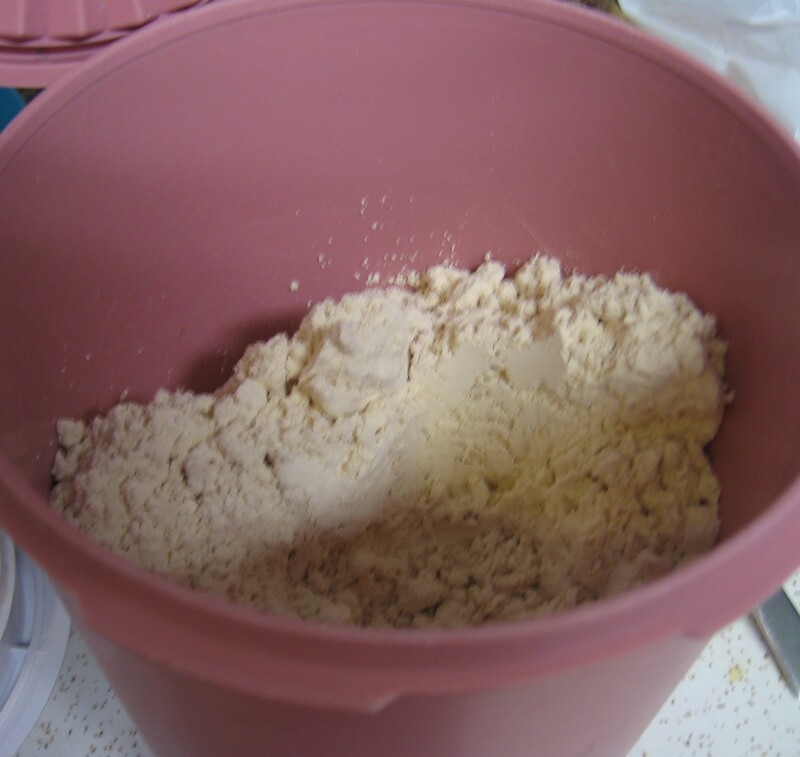 Using my basic Home Made Bread Recipe, add 1/4 to 1/2 cup of dehydrated vegetables to 2 cups of water in a microwave safe cup and heat it for about 1 minute. 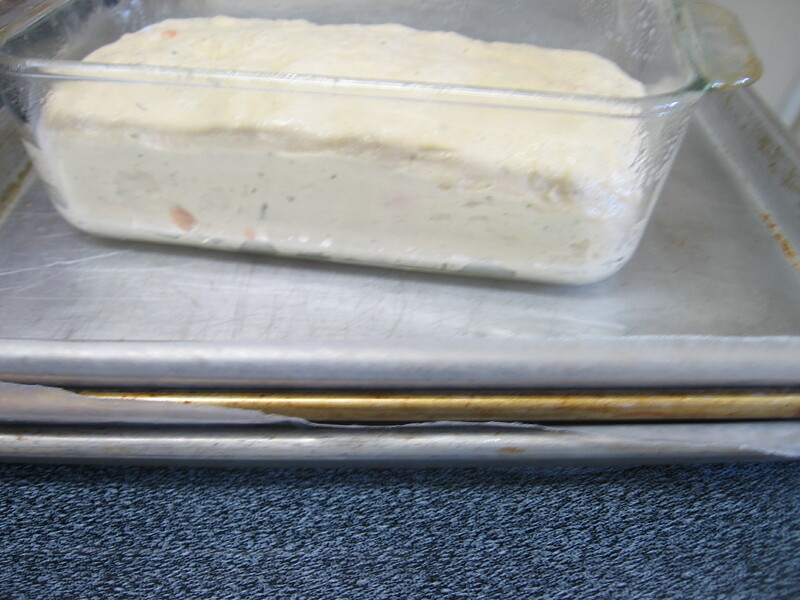 Let it set for five to ten minutes before adding the rest of the water and mixing the dough as written in the original recipe. You can buy the soup from the bulk section at WinCo or use a package or two (to your liking) of Knorr Vegetable Soup Mix. Be particularly careful not to add so much flour that your rolls become hard and dry. 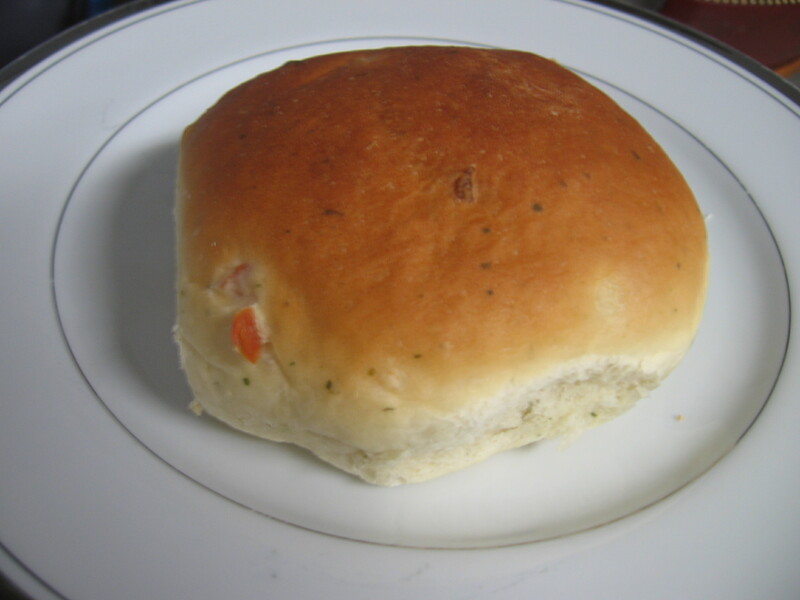 Sandwich Rolls are best when made from a very soft dough. Allow the dough to rise. Spray two baking sheets with cooking spray, shape the dough into rolls a little larger than golf ball sized and place a dozen dough balls on each. 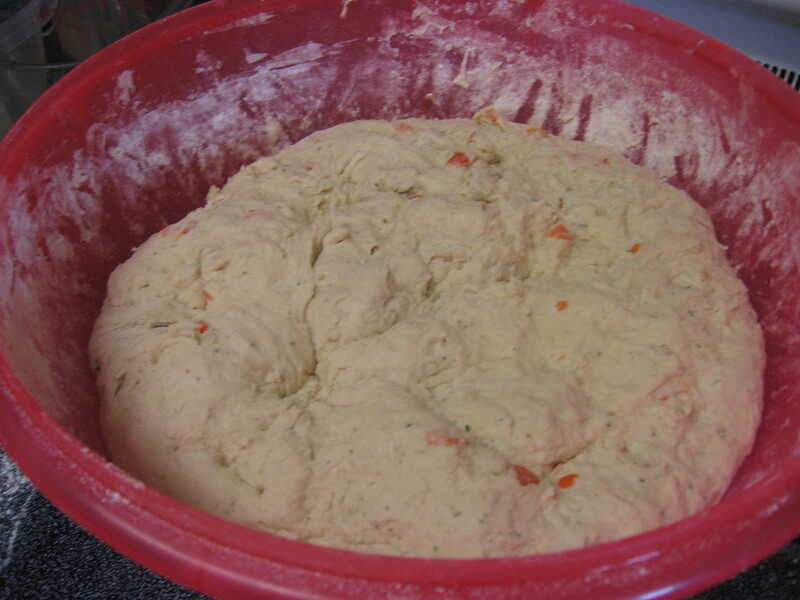 Oil or flour your hands to make the soft dough easier to handle. Lightly spray the tops of the rolls and cover them with waxed paper. Remove the waxed paper and allow to raise while the oven preheats or until they’re a little less than double. 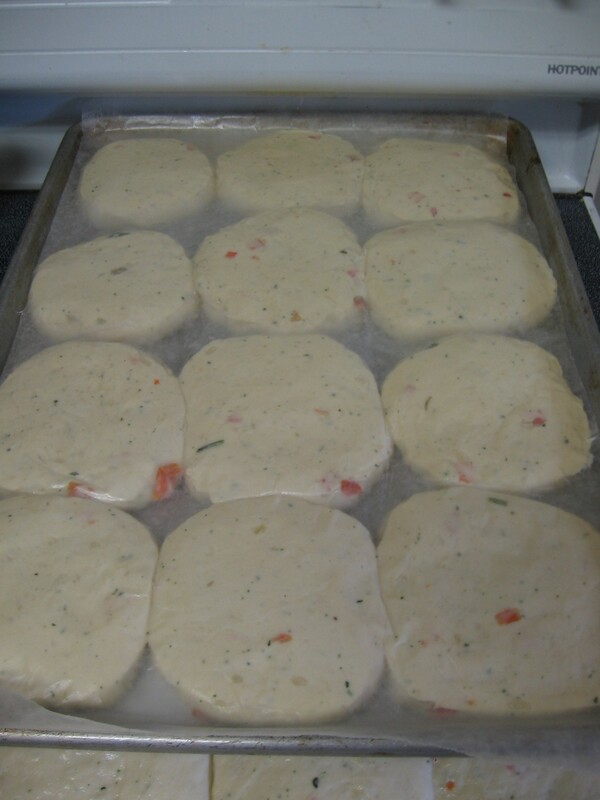 Bake at 400º degrees for about 15 or 20 minutes before checking for done-ness. As ovens vary, watch closely and remove when your rolls are golden brown. Serve sliced hot and spread with butter, as a side to soup or chili, or sprinkled with grated cheese and toasted in the oven. You can see that my hamburger patty shrank to smaller than the bun–next time I might try mixing a meatloaf burger with grated carrot, potatoes, onions, egg, and seasonings. No big deal, they were DELICIOUS served with a bit of mayo, catsup, caramelized onions, and a fresh tomato slice from my garden. Try Veggie Bread Sandwich Rolls for lunch with tuna, any variety of lunchmeat, chicken or fish patties, or with my all-time favorite: fresh tomatoes with mayo, salt and pepper, avocado, sliced cheese, and crispy lettuce. With the advent of a new school year, I feel the anticipation of cooler weather coming on. In my family, that means it’s about time to pull out the Taco Soup recipe. 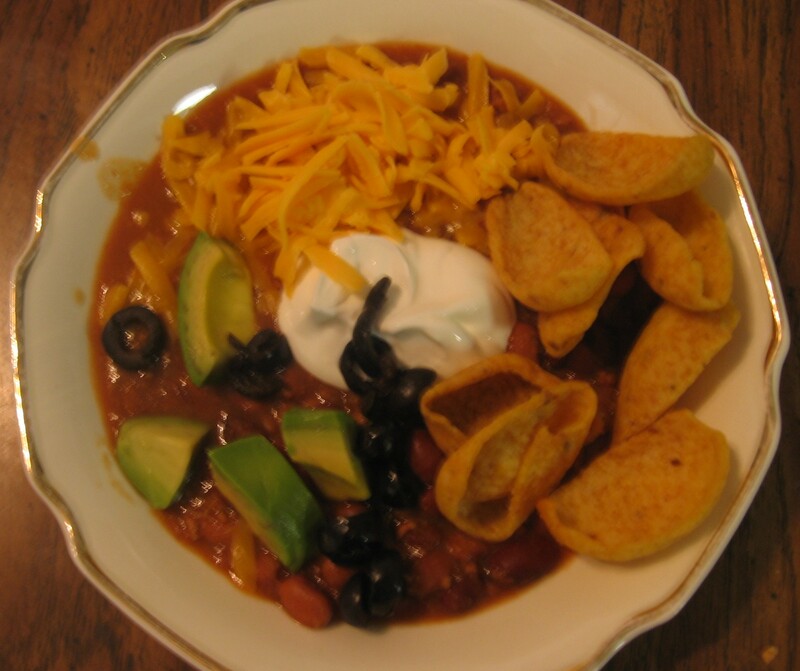 It’s basically just good old chili with a little taco flair, but the toppings make it a family favorite in cooler weather. It’s kind of festive–I almost expect them to ask if we can eat in the family room and have a movie night together when I tell the kids there’s taco soup for dinner. 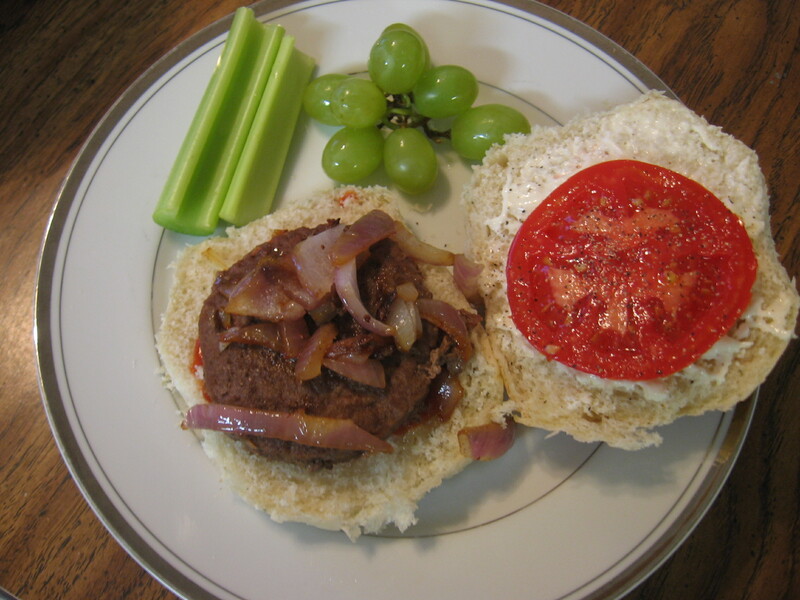 Brown the hamburger and onions. Add the rest of the ingredients and heat to boiling. 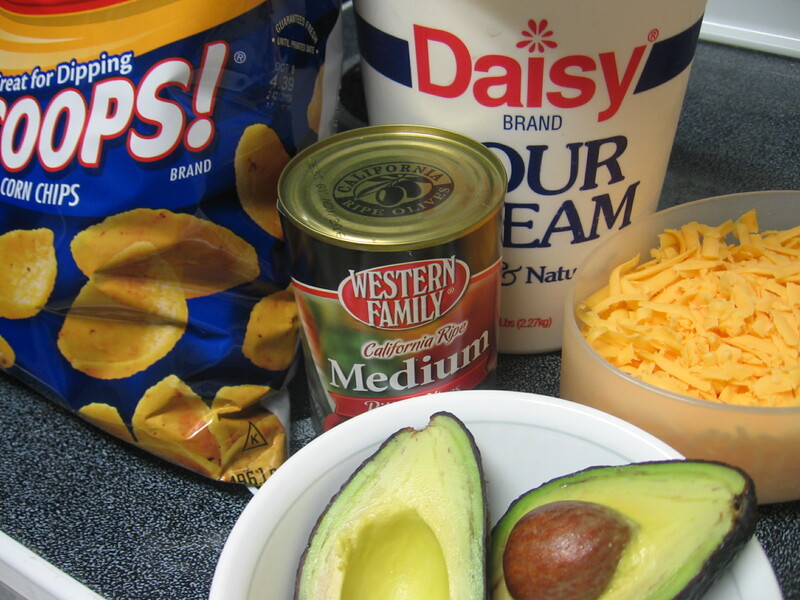 Serve topped with grated cheese, sour cream, Fritos, avocados, and sliced black olives. 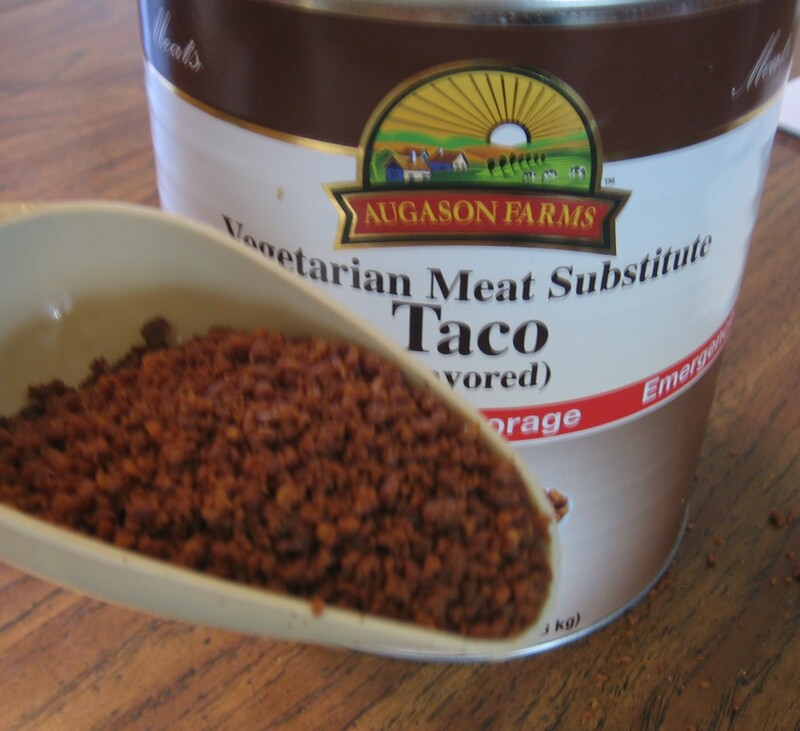 Several years ago I discovered that beef flavored or taco flavored TVP can save me the trouble of running to the store for ground beef, and the difference isn’t even detectable to a few finicky eaters I know. I buy them from the food storage aisle of my local grocery store or from Honeyville Foods, where I also discovered the magic of tomato powder. So, on to the recipe revisions! 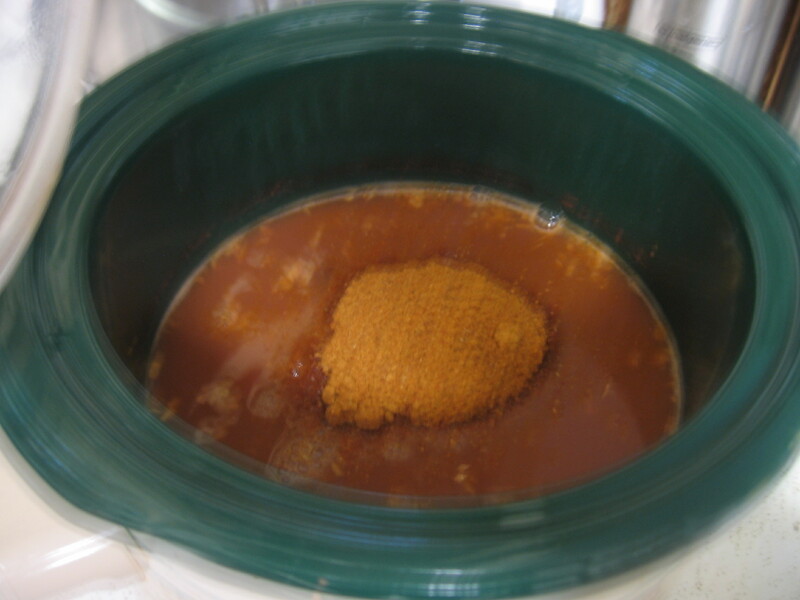 Using a slow cooker means you don’t have to soak dry beans overnight, but you do need to start cooking them first thing in the morning. 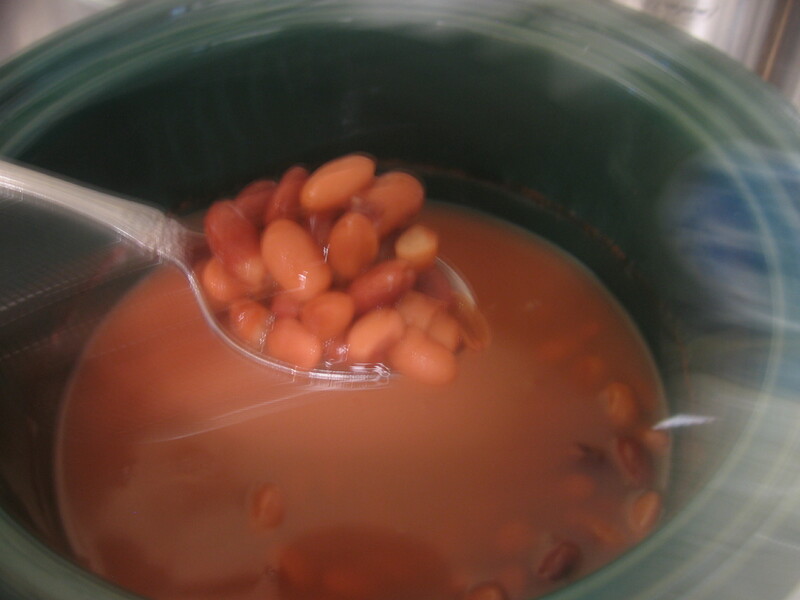 I sort and rinse about 2 1/2 cups of any combination of small red, black, or pinto beans and set them to cook in the slow cooker with water rising at least 2 1/2 to 3 inches above the level of the beans. Go ahead and leave them while you go to work or school for the day. 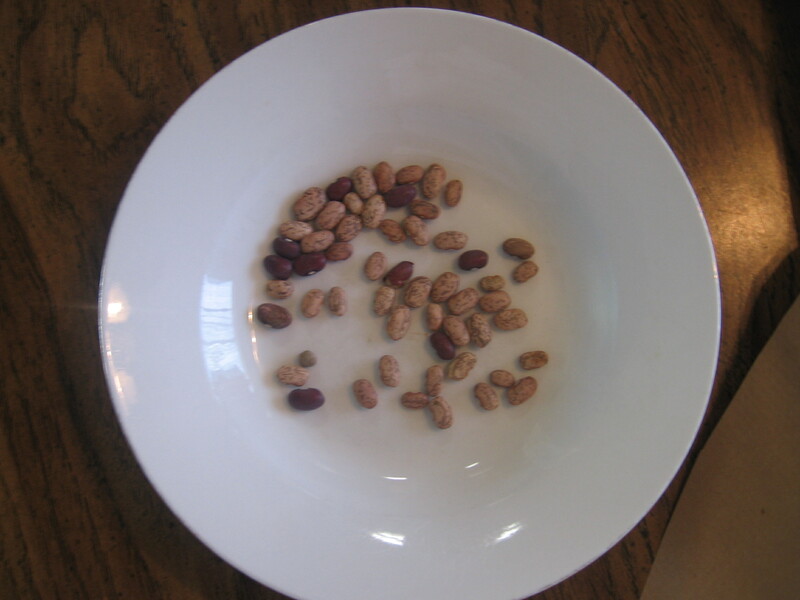 It is very important that your beans are fully tender before the addition of the other ingredients, which will prevent them from continuing to soften. Once the beans are done and about an hour before you want to eat, add several large, fresh puréed tomatoes or 2/3 cup *tomato powder. Depending on how much water was absorbed by the beans and how thick you like your soup, you may want to remove some of the water before adding fresh puréed tomatoes, and add water if you’re using tomato powder. 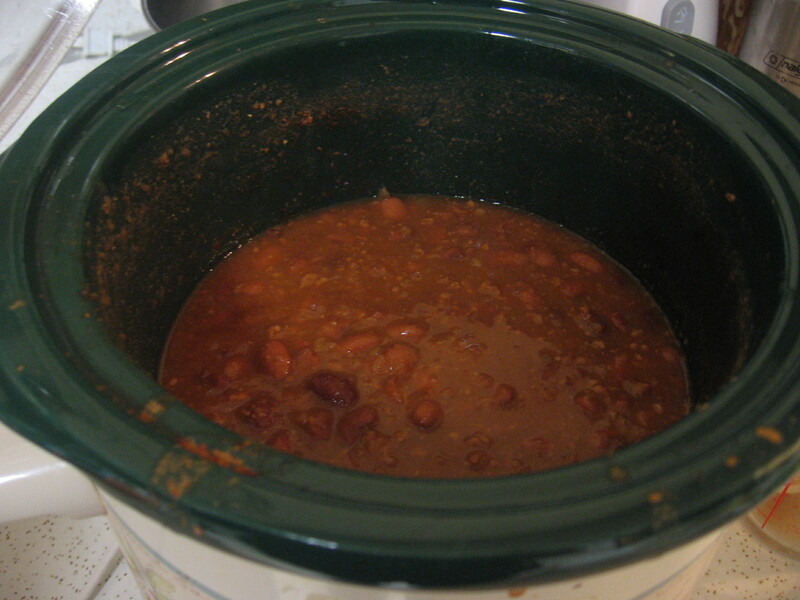 Brown your ground beef and onions together and add them along with the taco seasoning to the beans. 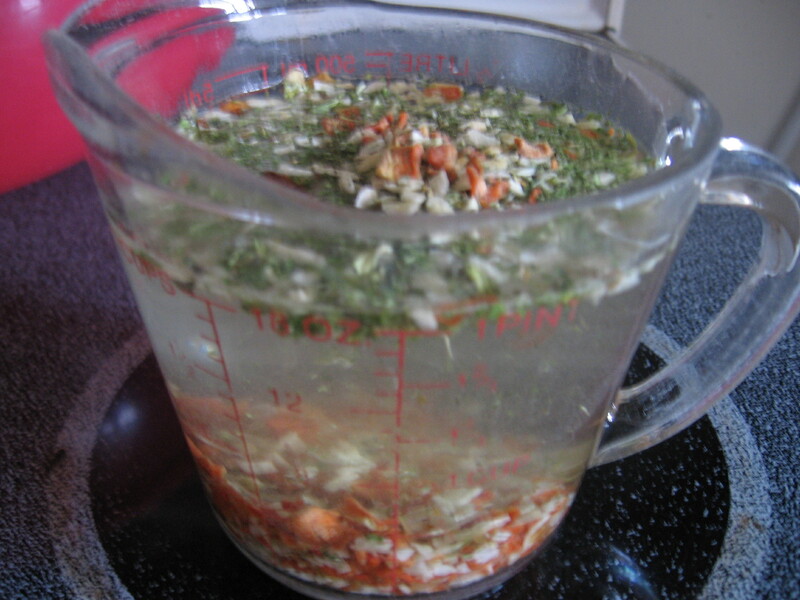 Alternately, place about 1/3 cup of TVP, about 3 Tbsp. 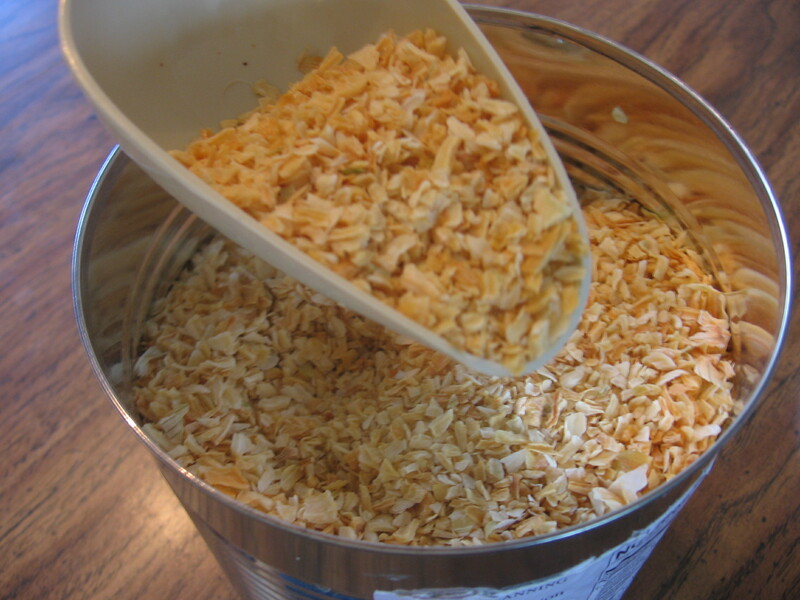 dried onion flakes and taco seasoning to taste directly into the cooker. 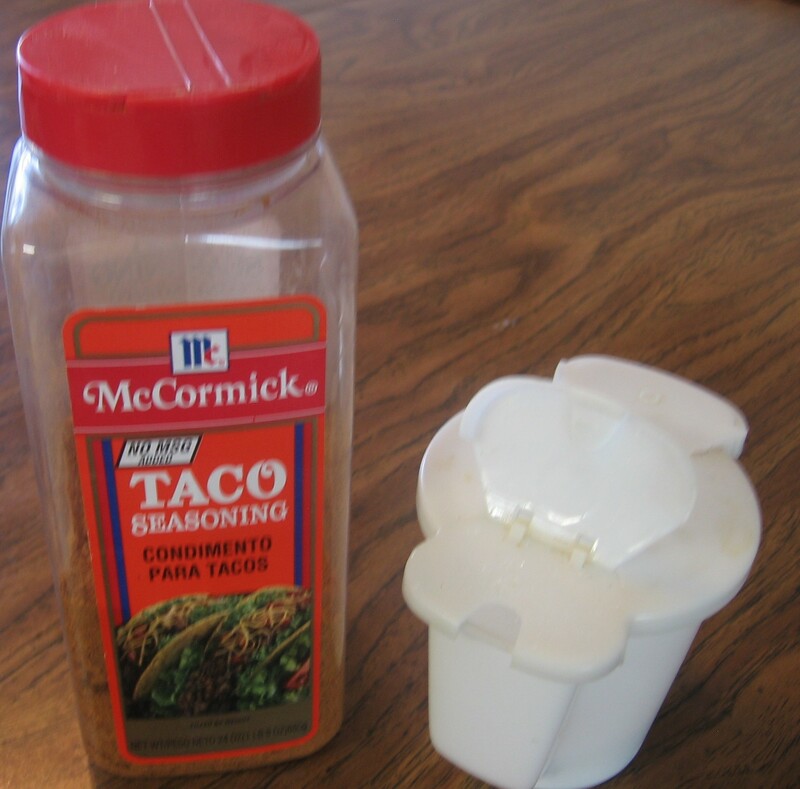 If you use taco flavored TVP you’ll want to consider cutting back on the amount of seasoning. Commercially canned tomato products tend to be a bit more acidic than homegrown, so I always add about 2 tablespoons of lemon juice and my own secret ingredient–about a tablespoon of sugar–and salt to taste. Replace the lid and allow to heat throughout, then serve as above with grated cheddar, sour cream, Fritos, avocados, and black olives. Taco Soup may even be better the next day. This recipe will feed my family of four tonight and for lunch tomorrow. *A note about tomato powder: A bumper crop of tomatoes in your garden can leave you with a lot of work to do. If you choose to bottle them “stewed,” or make salsa, chili sauce or catsup, you have to schedule a large block of time precisely when your tomatoes are ripe. 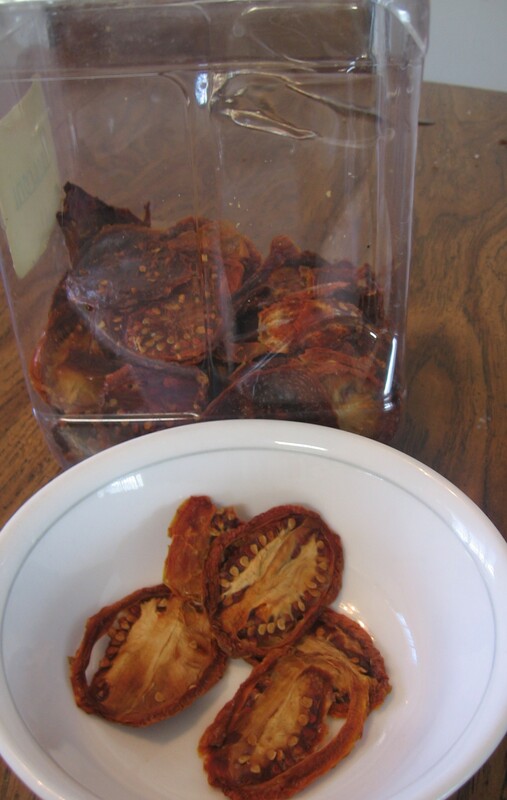 Dehydrating sliced tomatoes (1/2 to 3/4 inches thick) is much less time and labor intensive, and I have found it to be more economical, as well. They can be done in spare moments here or there each day over the harvest season, and stored in any airtight container until you’re ready to use them. 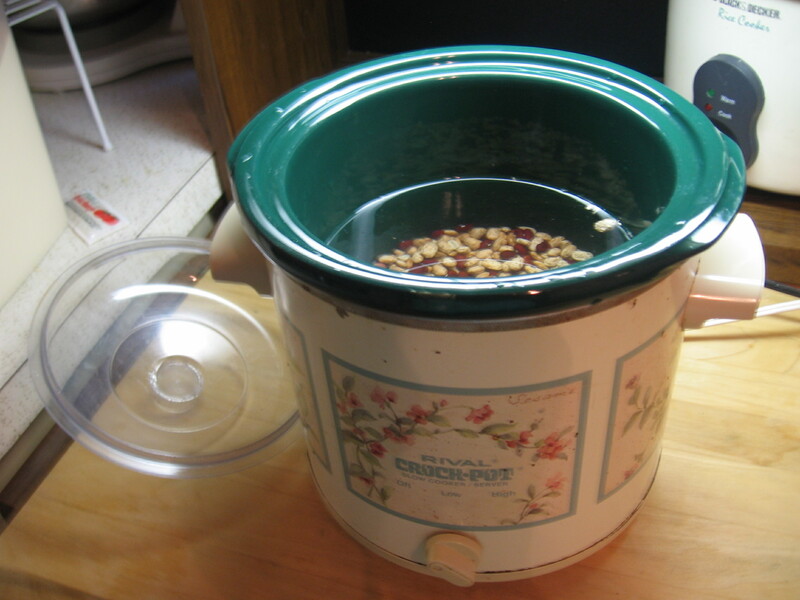 They don’t require any special jars or equipment, other than a way to dehydrate them (click here for several options.) Once dehydrated, I have puréed them with water in the blender and also made my own “tomato powder” by blending them dry–either method is quick and convenient to use in recipes calling for tomato sauce or paste. Snap your tomato sliced “chips” into smaller pieces and blend them in quick bursts if you want to reconstitute them with a little more of a chunky texture. It hasn’t really been so long since Spring and my popcorn tree post. The branches of my apple trees are bowing low and green apples are about three inches in diameter. 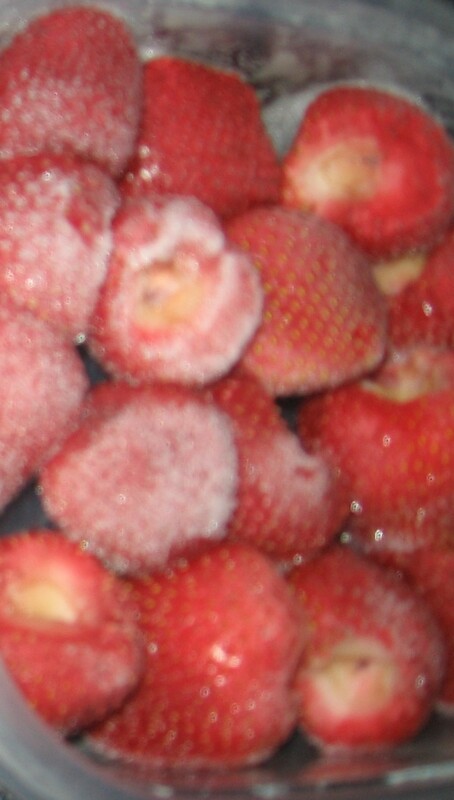 They won’t be ripe for another several weeks–long enough, I hope, that we have a good frost to sweeten them up. But the peaches, as predicted, were ripe two weeks before any others in the area, and just as I was ready to leave town for girls camp. In a dozen years I still haven’t figured out pruning. When the little fruits were the size of almonds I started to thin, and thin, and thin them. Then I decided the tree was just too overgrown and took some branches off–about half the tree, including every one that would produce peaches too high for me to reach while standing on the ground. I still didn’t thin enough and my little tree’s branches are hanging over the fence, low to the ground with juicy, little peaches the disappointing size of apricots. I took a small bucket full of them to serve my campers and have since doorbell ditched a number of my neighbors with bags of peaches. I’ve invited family and friends to come and take all they want. But I’m afraid the birds will enjoy more of my peaches than my family will. They’re about overripe, now, and I just don’t have time to process them all before they fall off the tree. I grew up on bottled peaches and learned the process as a kid–tons of work! I’ve also made peach jam, dehydrated them, and puréed them for fruit leather (not a good idea–they’re far too juicy!) But the best thing to do with peaches is to eat them fresh cut with milk poured over them. 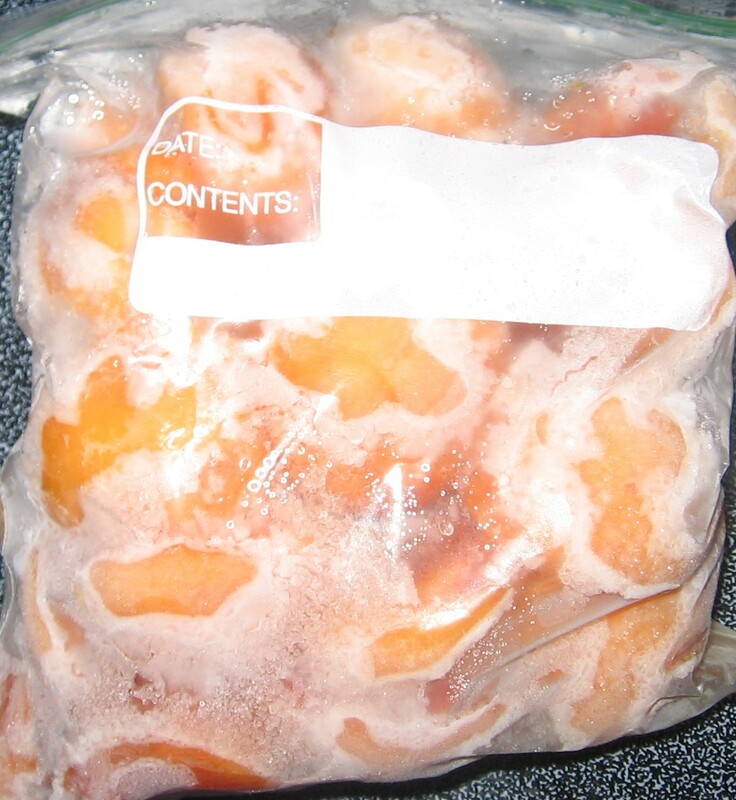 Second best (and the easiest way to store them) is to halve, remove the pit, and peel them, then pack them loosely in quart sized zip bags in the freezer. Although you could, I don’t even use preservatives like “fruit fresh” on them–just freeze them quick and they’re ready to use any time I want to make a cobbler or my favorite: Fruit Breakfast Smoothies. 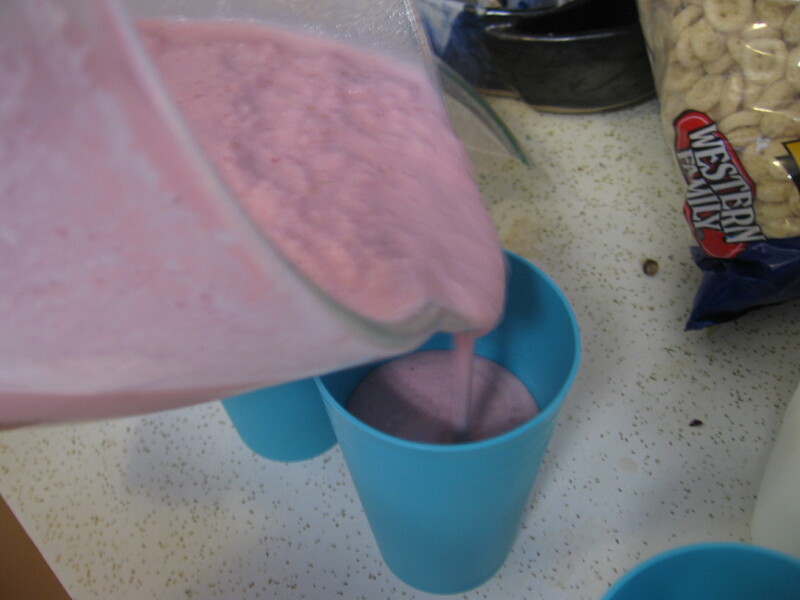 I start by pouring 2 1/2 cups of milk in the blender, and add four to six frozen half peaches and a frozen banana. I blend it on a high setting, adding more frozen fruit (strawberries, cherries, mangoes or blueberries are good) until it’s thick and smooth. 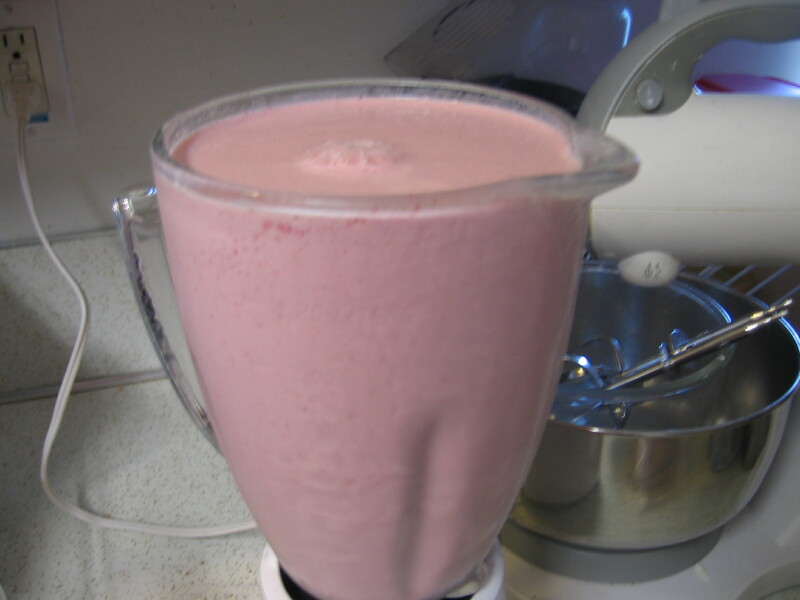 If it’s too thick for the blender to handle, I add about a quarter cup of milk–just enough that it can blend all the lumps out. Usually there is no need for any sweetener–the banana takes care of that–and I don’t like a lot of sweetness. But sometimes I don’t use bananas and instead give it a squeeze of honey (maybe a tablespoonful) and a few drops of vanilla flavoring. You may also add a couple tablespoons of whey or soy protein powder–I buy them unsweetened and unflavored in bulk at WinCo, but you could add a scoop of vanilla or strawberry flavored protein, and omit the honey and vanilla flavoring. Divide between four glasses and enjoy! Just a note on Freezing Bananas: They are perfect to freeze for smoothies the day they begin to have the first little brown spots. If you’re lucky, you can catch them at a reduced price in the produce department, or buy them when they’re a little green or just ripe and freeze them on the day they reach that brown spot point. I put them right in the freezer–peel and all. They’ll keep for at least a month or two that way. When I’m ready to use them in a smoothie, I hold them under warm water for about 15 seconds, then cut the peel off with a paring knife. After, After, After, Before. You get it. Ready. . . Set. . . Hurry before the weeds pop up again. . . I didn’t have time to collect enough paper for the recommended 1/2 to 1 inch, but something is better than nothing, so I spread a few days’ newspapers and “bulk business mail” around the plants and soaked them with the hose. Then I bought a compressed bale of straw (boy, does that go a long way!) and spread it on top, about 2 inches thick. I set the soaker hose on it and drenched it all again. I had a partial roll of black weed-discouraging fabric on hand, so I used it up as far as it would go, securing it with rocks and stepping stones around the edges. Then I left town for a week with instructions for my house sitter to deep water it twice while I was gone. When I returned and checked them, the tomatoes, potatoes, lettuce, and chard were looking good, considering their late start. 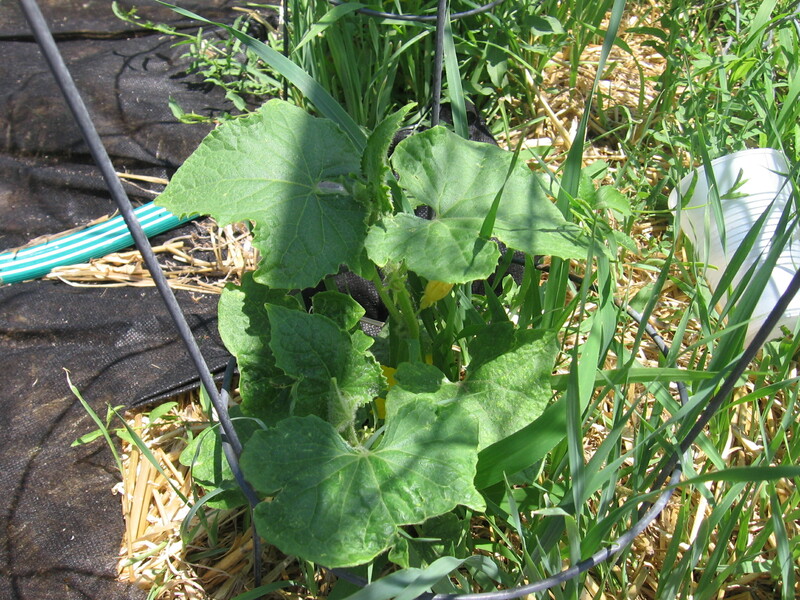 The cucumbers were being strangled by weeds, and only one of the squash plants was even still there. (??) The most notable thing was the grass growing about six inches up through the layers of straw and puffing up under the black fabric. 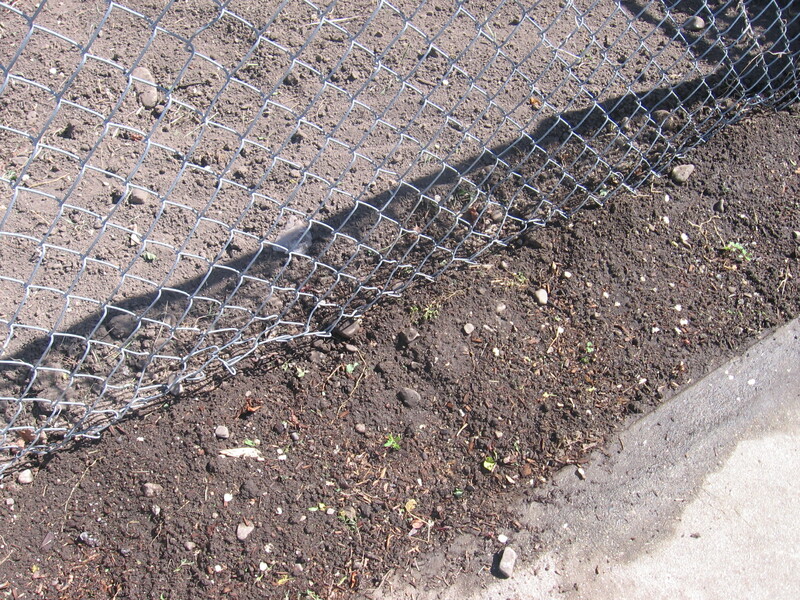 First, unless it’s covered in mulch, black fabric weed prevent-er doesn’t actually prevent weeds from growing. Secondly, straw is probably more beneficial to maintain soil moisture and as compost for next year than a weed deterrent, but I did notice that broad leaf weeds didn’t grow up through the straw, just grass! 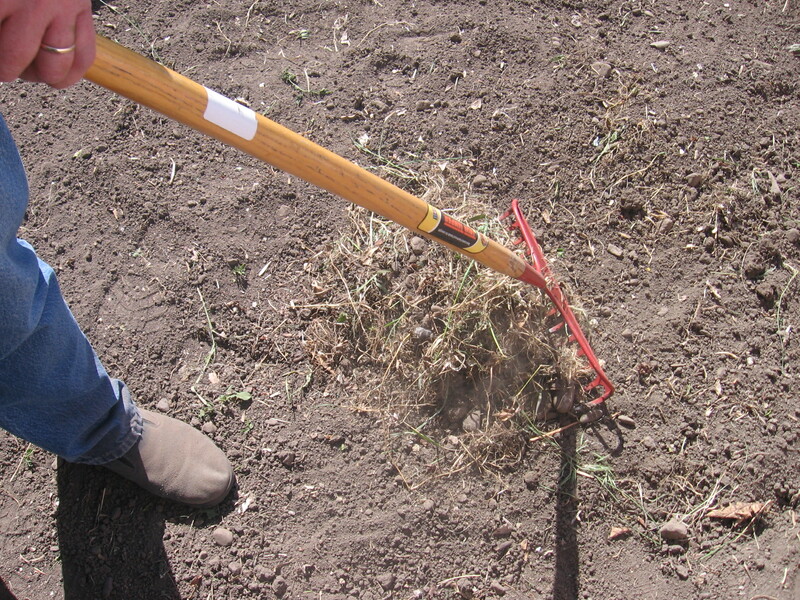 Third, grass is much easier to pull from the straw and the soft moist soil beneath it than from the hard, caked soil you get when the sun beats down on it directly, and it’s a great addition to your layer of straw mulch. Overall, it’s probably a lot better than if I had left it without any mulch, but covering the whole garden with lots of newspaper first would definitely be preferable. 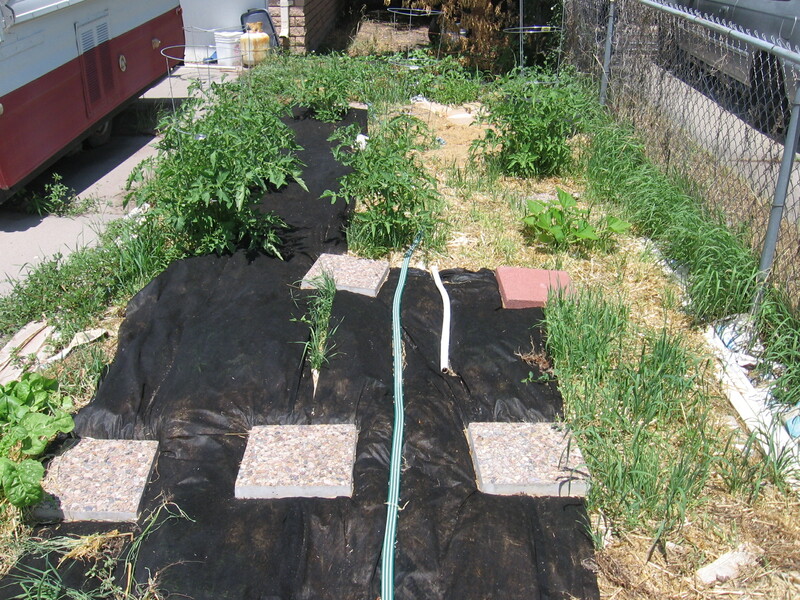 Just look at the grass coming up between the strips of weed deterrent fabric! I took these pictures about two weeks after spreading the straw. Although my garden is a long way from perfection, I enjoyed a batch of steamed chard for dinner last night–YUM! Those fresh veggies are definitely worth the effort. 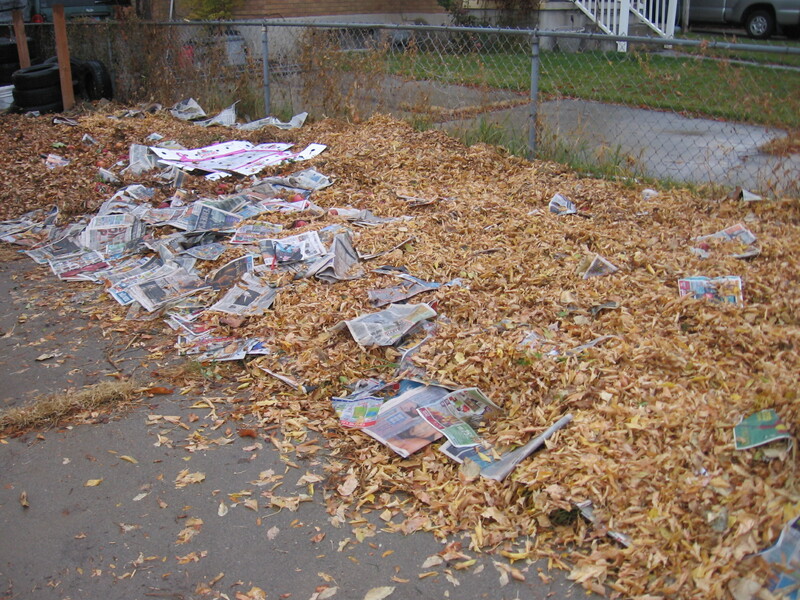 I am not giving up any time soon, so I have no choice but to look forward–to next week, next month, and next year–and to keep collecting newspapers, grass clippings, and leaves! 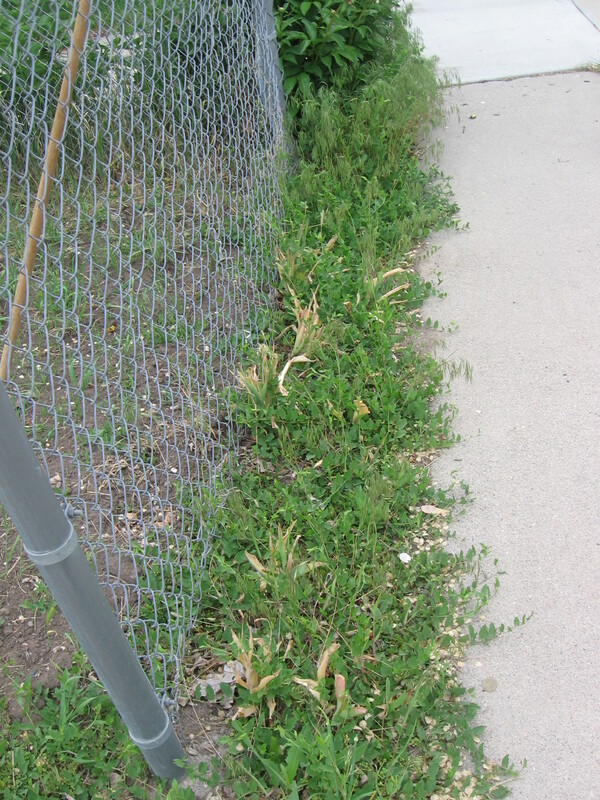 I guess I don’t really even mind a few weeds, as long as there is something to show for the effort in the end. 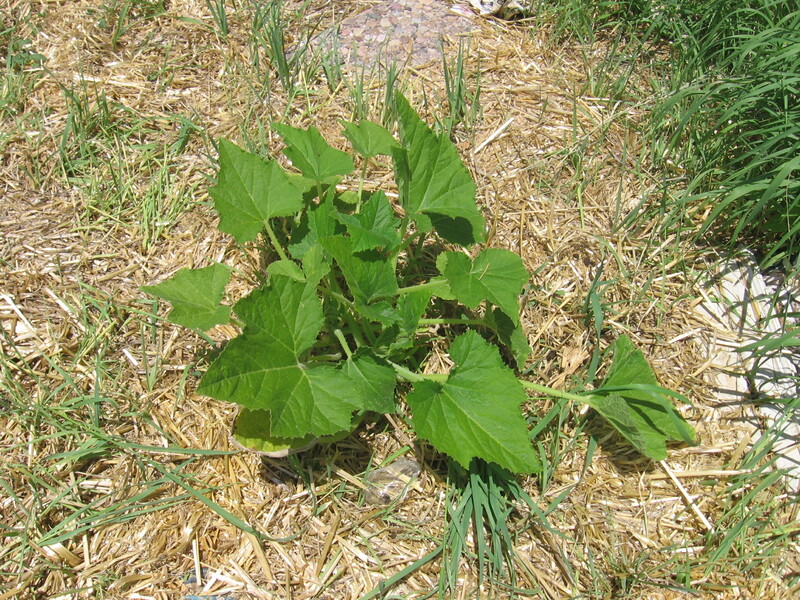 This cucumber plant is finally getting the advantage over the weeds surrounding it. Pathetic looking squash plant, isn’t it? I’ve never had trouble getting these to thrive! 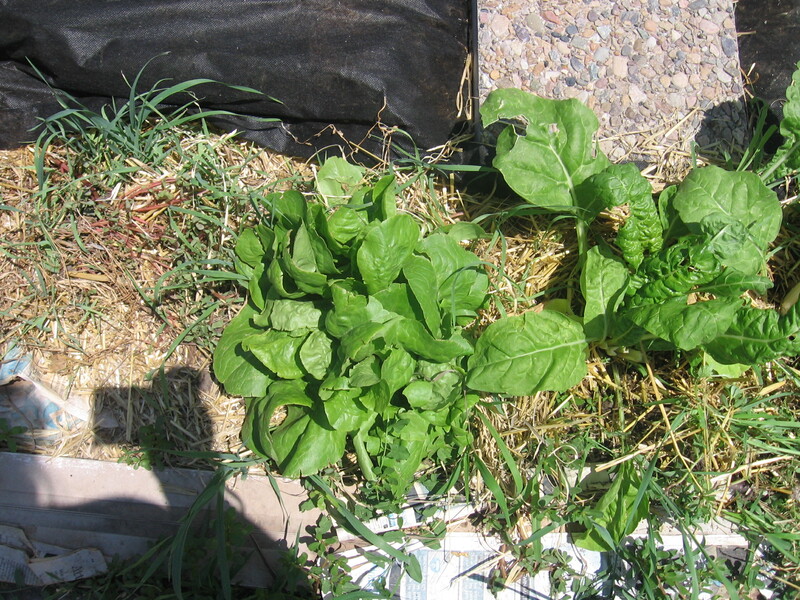 Even though they’re surrounded with would-be stranglers, the lettuce and chard are looking good! As much as I wish otherwise, I admit I am really no gardener. That being said, every year when the snow is piled high and I can’t stand another morning of scraping frost off the windows of my car, I still make my annual escape into the dream zone of planning my vegetable garden. I just can’t help hoping that I will eventually grow a green thumb. For years I won’t number, I have started anywhere from the end of January to sometime mid April, to plant my tomato seedlings and zucchinis and cucumbers. There’s just something so therapeutic, particularly late in the winter months, about playing in the dirt and anticipating the emergence of those tiny green leaves. It gets me through those last hard months of cold weather. The sprouts always come up within a week or so. Then over the next few weeks it’s the same old thing. They grow tall and spindly with nothing more than that first pair of tiny green leaves, only slightly larger than at first sight. They sprawl all over and tangle up with each other. I know what the problem is. The lighting doesn’t include enough of the color spectrum to encourage leaf growth. When they have died of neglect (because I can’t bear to look at them) I usually try it for a second time. (After all, I am persistent.) Then, on a sunny weekend about the first of June I toss the parched jiffy pots into the garden, till them under, and head for the garden store for seedlings. Here they are doing the most difficult part! disclaimer: slanted ceiling alert! We really did hang this level!